Long before the deaths and injuries, Takata knew its airbags were defective, according to two former employees of the company. In fact, Takata knew about the defects as far back as 2004, the workers told The New York Times. The Japanese company learned one of its airbags exploded and sent metal debris spewing at a driver in Alabama, then began secret testing at its U.S. headquarters in Michigan. The testing was conducted outside normal work hours and was never disclosed until now. Three months into testing, employees began to theorize the problem was the welding on the airbag’s inflator canister, but the investigation was shut down and employees were instructed to destroy all testing data. It took Takata four years to report the faulty airbags in a regulatory filing. In November 2008, the first Takata airbags were recalled. The law requires car manufacturers to report safety defects to the government within five days once they are identified. This year has seen the most auto recalls in U.S. history and some hefty fines for Toyota and General Motors for failing to disclose defects. In March, Japan-based Toyota agreed to pay $1.2 billion to the U.S. government to avoid prosecution for hiding “unintended acceleration” defects. In May, General Motors was ordered to pay a record $35 million civil fine for failing to disclose deadly ignition switch defects. Starting in 2008, Takata’s airbag recalls continued slowly, then got a big push last month from the National Highway Traffic Safety Administration (NHTSA). NHTSA issued a consumer advisory which urged drivers to immediately check if their vehicle’s airbags had been recalled and arrange for a repair. To date, 11 car manufacturers have recalled more than 14 million vehicles worldwide. Four deaths have been linked to the defective airbags and at least 139 people have been injured. Check Your Car. Every driver should check if their car has been recalled at SaferCar.gov. You can also read our blog for answers to many common consumer questions. Most impacted drivers will have to wait for replacement airbags so it is best to call your local dealer as soon as possible. Some carmakers are advising drivers not to carry passengers until their airbags have been replaced. Why the Airbags are Defective. 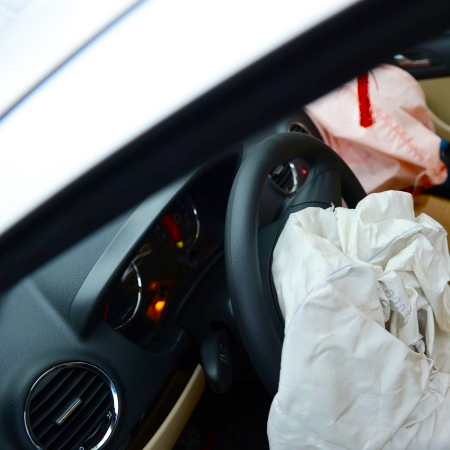 The airbags are defective because they have a steel canister which can crack when the device deploys in a car crash, sending metal, plastic and chemicals exploding at drivers and front seat passengers. The airbags have an inflator, which is comprised of a propellant based on a common compound used in fertilizer. Honda. One question going forward is: How much did Honda know? This matters because Honda made more than 5 million of the recalled vehicles. The New York Times reports a 2002 Honda Accord was involved in the 2004 accident in Alabama. Honda officials say Takata assured them the accident in which a driver was injured by a ruptured airbag was an “anomaly.” Honda settled the case with the driver but Takata began its own secret testing, according to the employees. The NHTSA has ordered Honda to produce all its documents related to the Takata airbag recall by Dec. 15, so we may learn more then.